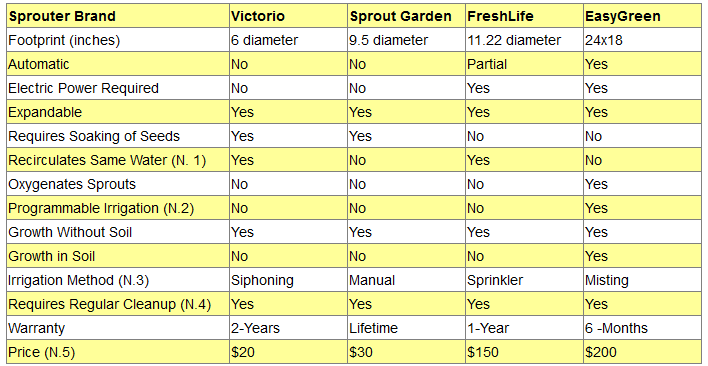 Compare Sprouting Kits: EasyGreen, FreshLife, Victorio or Sprout Garden? Sprouts are all at once easy to grow, nutritious, economical, ecological and delicious! You can sprout not just seeds and beans, but also legumes and the results can be amazing! You can use various types of sprouts to make all kinds of healthy salads. You can mix them with tomatoes and other vegetables, and top the whole thing with a drizzle of garlicky olive oil. The result will be healthy bliss! We recommend sprouting seeds at home to everyone as it is like growing year round your own fresh organic vegetables at home (note that in the rest of this review the term "seed" will be used to designate anything that you can sprout, including legumes and beans). Even though you could use the basic method described below to grow sprouts, it is better to use commercially available sprouting equipment that simplifies the task and eliminates certain problems. Manuals sprouters may require soaking of seeds prior to use as well as manual watering and rinsing at regular intervals. With automated sprouters soaking is usually not required, and the tasks related to watering and rinsing of seeds is done automatically once the reservoirs are filled with water. People who are forgetful and not well organized should definitely go for the automatic sprouters, as skipping one single rinsing could spoil the sprouts and turn them sour or rancid. In this sprouting equipments review, we will describe and compare the manual Victorio and Sprout Garden, as well as the automatic EasyGreen and FreshLife sprouters. All four brands have received good reviews from Amazon customers and are very popular. A comparison table that summarizes their differences is provided further down for a quick assessment of the four brands. Sprouts have a higher concentration of proteins, vitamins, minerals, and enzymes, and they are easily digested and assimilated. Eating fresh sprouts strengthens the immune system like no other food or nutritional supplement can. When you produce your own sprouts, you can be sure that no chemicals in the form of pesticides, fertilizers, etc. were used, and they are always fresh when you cut them. Sprouts can be grown rapidly and easily from any type of seeds (see below for basic cultivation principle). There is practically no limit to the variety of seeds you can use. It is also very economical: not only seeds are not expensive to obtain, but you can generate large volumes of sprouts using small quantities of seeds, as the volume of sprouts generated after germination may be many times the volume of seeds used! By using sprouts of a varied colors and flavors, you can create attractive sandwiches or dishes that you will be proud to serve. As mentioned, cultivating sprouts is quite easy. In principle, all you need to do is soak the seeds for a period that depends on the type of seed used. You then rinse them and place them in a jar like vessel with the rim tightly covered with a piece of cloth to replicate the state of being under the earth. The jar is left at room temperature, 65°F to 85°F (18.3°C to 29.4°C), until full sprouts are obtained, but to provide them with the required moisture and prevent them from souring and rotting, the sprouting seeds need to be rinsed and drained a number of times per day, the number depending again on the type of seed used. Though there is practically no limit to the variety of seeds that can be used for sprouting, care should be taken to get them from trusted sources to avoid inedible seeds and bacterial diseases that can be caused by contaminated seeds. Also, it is primordial that the sprouting (germination) method be strictly hygienic to avoid bacterial contamination of the sprouts at any stage of the process. Finally, you should always obtain information on the watering and rinsing requirements of the type of seeds you will be using so that you can provide them with the right conditions for optimal sprouting. This is a very simple sprouter composed of 4 separable stacked seed growth trays. There is a top reservoir tray where the water is poured and a bottom basin tray where the water drained from the upper trays is collected. The reservoir lid will keep dust, insects, etc. from getting into the seed trays. Each of the four growth trays is designed to use water surface tension to keep the correct amount of water in the tray for all stages of the growing process. Once the four middle trays are covered with pre-soaked seeds, water is poured into the top reservoir tray, The water gets siphoned down to the lower trays and ends up in the bottom basin tray. Remember to empty the basin tray when top trays are completely drained or before the next watering. You will need to rotate the bottom tray to the top of the stack before each watering and replace the reservoir lid on top. The seed trays need to be rotated because the lower trays get already used water from the upper trays, and if no rotation were done the results obtained from the lower trays would not be satisfactory. Fresh unused water always enhances the proper growth of the seeds. ​Be sure to water your seeds 2-3 times each day. It is important not to spread too many seeds on a given tray so that there will be enough space for them to expand. ​It should normally take from 3 to 5 days to get your sprouts. Note that this system is expandable and additional growth trays can be bought separately and added to the basic configuration. The Victorio sprouter is a compact unit that can be easily placed on the kitchen counter. It should ideally be placed at room temperature away from direct sun light. It is important to take apart the unit after each use and clean it thoroughly, including the siphon hoods, to avoid mildew formation and to free all parts from any stuck seeds or sprout bits. The sprouter can be hand washed, using a soft cloth and warm, soapy water. Make sure you dry it thoroughly before storing. If desired, it can be washed in the dishwasher, but on the top rack only. DO NOT use the drying cycle. Pros: low cost, simple to operate, no soil required, small countertop footprint, no power required, stacked four trays can grow four crops at once, siphoning system prevents over watering, BPA free, 2-Year warranty. Cons: seeds need to be pre-soaked, trays need to be rotated, siphons could get plugged, thorough cleaning required after each use, requires manual watering and manual draining of used water. First soak the seeds in jars for about 8 hours. Transfer the seeds from the jars into the trays and let the water drain. Rinse the seeds in each tray under cool water and make sure all the water is drained from the trays. Stack the trays, and place the cover on. Rinse the trays twice a day (morning and evening) for about 4 days. Each time make sure all the water is drained, and the sprouts get thoroughly washed. This will prevent them from molding,souring, or rotting. Pros: low cost, simple to operate, no soil required, small countertop footprint, no power required, stacked three trays can grow three crops at once, by buying multiple sets can stack even higher, BPA free. dishwasher safe, lifetime replacement warranty, comes with good instructions. Cons: pre-soaking of seeds required, some drainage holes may get stuck, thorough cleaning required after each use, requires manual rinsing and draining. This is an automatic sprouter in the sense that it comes with a built-in special sprinkler system that is able to determine environmental conditions (such as humidity, dryness,etc) within the unit and automatically irrigates the sprouts when required. It is composed of two barrels: the lower barrel is the reservoir filled with water, and the upper barrel is where the seeds are spread and the sprouts grow. A sprinkler tube goes through the middle of the barrels, from the bottom all the way to the top where the actual sprinkler is fitted (see picture on the right). If desired, a second sprout cultivation barrel can be added by stacking it on top of the first one. This doubles up the volume of sprouts grown. Each barrel can yield about 8-16oz sprouts, and each comes with two circular trays. The first tray goes on the bottom of the barrel and that is where the seeds are spread. The second tray is placed on top of the seeds to keep them in place until they start sprouting. Once they start sprouting the second tray can be removed. Each seed tray is divided into 4 quadrants and this allows the cultivation of 4 types of sprouts per barrel. The unit does not take too much space and can be kept on the kitchen counter if desired. Just like the previous sprouters discussed here, this unit does not require any soil. Fill the lower barrel with water to the fill-line adding a drop of human grade hydrogen peroxide to prevent molding issues. Place the seeds on the circular tray lying on the bottom of the sprouting barrel. Cover the seeds with the second circular tray. Cover the barrel with the lid. Plug the unit to the power outlet. The sprinkler will be activated automatically as required. But the water in the reservoir will have to be changed daily (and even twice a day for better results) as recycled water full of toxins and other impurities hinders the growth of sprouts. Also, the barrels and the trays should be wiped clean after each use to prevent contamination. 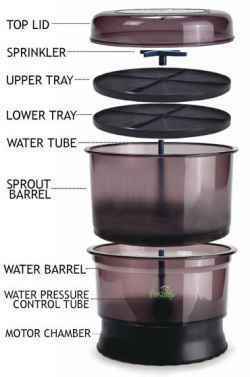 Pros: simple to operate, no pre-soaking of seeds required, small countertop footprint, stackable: two barrels can grow 8 types of sprouts all at once, sophisticated sprinkler system prevents over watering, BPA free, 1-year manufacturer's warranty. Cons: thorough cleaning required after each use, water is recycled and therefore the reservoir water needs to be changed as often as possible to prevent sprouting problems, all parts must be hand washed. Click hI reserved the last for the best of all. This is truly the Cadillac of sprouters! It is expensive (about $200), but when one considers the list of features it comes with, the price is quite justified. The EasyGreen sprouter is a large plastic box called the MikroFarm measuring 24x18x7.5 inches. It can contain up to 5 rectangular trays for sprouting various types of seeds. It has a built-in 1-gallon water tank and is equipped with its own mist generator and a 3-foot drainage tube that can be directed into a sink or any container large enough to collect the water waste. It also comes with a 96 activations timer that can be used to control the humidity for optimal sprouting of the seeds. The most important feature that differentiates this sprouter from other brands (both manual and automatic) is that it is able to supply simultaneously mist and oxygen to the seeds. Sprouts don't need a lot of water, but they they need a lot of oxygen to grow properly. Watering them with just a light mist and providing them abundantly with the required oxygen does the job perfectly well. The large built-in tank allows for irrigation water to be used only once. Using recycled water full of toxins and other impurities hinders the growth of sprouts. With the EasyGreen sprouter, once the tank is filled, it is able to provide enough fresh water for the whole day. You just need to fill the tank when the water level is low (the water level can easily be monitored without opening the unit). Used water is continuously drained through the attached pipe. The water tank also allows adding to the irrigation water growth enhancers such as minerals as well as disinfecting substances such as hydrogen peroxide that prevent contamination and molding. Too much humidity is harmful to sprouts, and when the weather is already humid, one needs to decrease the amount of mist provided. Also different seeds require different amounts of humidity. The 96 activations timer allows you to provide the seeds and sprouts with the right environmental conditions (in particular humidity) for ideal growth. The 24 hour timer schedule can be adjusted for dry or humid weathers for the appropriate watering cycles in 15 minute increments. Soaking the seeds prior to use is not required with the Esygreen sprouter, and all required operations such as rinsing, oxygenating, misting, and draining is done automatically. So aside from filling the tank once a day, you don't have to do much to get perfect sprouts. With EasyGreen, it is also possible to grow sprouts in soil if desired (some seeds grow better in soil). So one has the option of both hydroponic and in-soil cultivation. To start the unit, it needs to be placed on a flat surface and plugged to a power outlet using the included timer device. The timer can be programmed to activate the mist generator at different times of the day for different intervals depending on the type of seeds used. The discharge tube should be directed into the sink or any container large enough to hold the drained water. All one has to do is fill the water tank when the water level is low and empty the drainage container when it gets filled up (unless the unit is placed by the sink and water is already discharged into it). 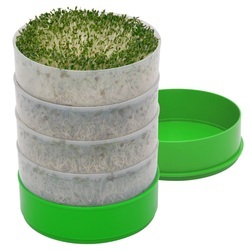 Also, as shown in the picture here, several EasyGreen units can be placed on top of each other for growing larger quantities of sprouts.You may start with one unit and then expand to multiple stacked units as you widen the scope of your sprouting experience. Being a complex machine with many parts, the EasyGreen sprouting unit requires weekly and periodical cleanings to eliminate any risk of contamination and make sure that it continues working properly. For the weekly cleanings you will need to remove the trays and wipe and disinfect well the interior of the compartment following the instructions provided in the owner's manual. The periodical cleanings will have to be done 3 times a year. The owner's manual details also all that needs to be done during the periodical cleanings. Pros: simple to assemble and to operate, no soaking required, automatic misting, automatic rinsing and draining, explicit oxygenation, programmable misting, uses always clean water, five trays can grow five different crops at once, by stacking multiple units can grow very large quantities and varieties of sprouts, can grow sprouts with or without soil, all trays in accordance with FDA regulations, 6-months warranty, comes with owner's manual. Cons: higher cost, larger footprint, electric power required, requires regular and periodical cleaning and maintenance to eliminate contamination risk and make sure it works well. Note 1: Using recycled water full of toxins and other impurities may hinder the growth of sprouts. Only EasyGreen makes sure that always clean water is provided to the sprouts. With FreshLife, the same water is reused to sprinkle the sprouts again and again until the water in the reservoir is changed. With Victorio and Sprout Garden, water from the upper trays will trickle down to the lower trays. Note 2: Only EasyGreen allows explicit programming of the irrigation schedule using the provided timer. Though the FreshLife sprouter does not allow irrigation programming, its sprinkler detects when humidity is low and automatically start sprinkling the sprouts. Note 4: In order to prevent contamination and ensure the equipments are working properly, regular cleanup and maintenance of all sprouting equipment is a must! Please read carefully the instructions provided with the product (in the user manual or other documentation) to make sure that you are following properly cleaning and maintenance instructions. Note 5: All prices are approximates as prices can change every day. So which is the best Sprouting Kit to buy? 1It does not recirculate already used water: Using recycled water full of toxins and other impurities hinders the growth of sprouts. Only EasyGreen makes sure that always clean water is provided to the sprouts. 2The irrigation of the sprouts is automatic and can be programmed to suit the type of seed used and the environment characteristics. With EasyGreen, not only would you never skip any misting which could be harmful to the sprouts, but you would program to mist less frequently in humid environments such as Florida, and more frequently in drier environments such as Arizona. 3It is able to supply explicitly oxygen to the seeds. Sprouts don't need a lot of water, but they they need a lot of oxygen to grow properly. Providing them abundantly with the required oxygen ensures healthy growth of delicious sprouts. If you want to spend less, you may want to consider next the FreshLife sprouter. It also automates the irrigation even though it can not be programmed. But at least you will not run the risk of forgetting to water the sprouts. As to the two manual sprouters, Victorio and Sprout Garden, for the low price they cost, they will provide you with plenty of delicious sprouts as long as you don't forget to water and rinse them adequately as required by the type of seeds you are using and by the environmental conditions surrounding the sprouts. Please click the sprouter images below to check their price or to purchase.